Kids always "make" stuff, what's different from a generation to another is what they use to give shape to their imagination, from clay to Lego bricks. 3D printing will eventually be kids' new making technology, of course, but today an average 3D printer can't be used by kids: it's not safe (too moving and hot parts) neither fun (who would leave his/her kid alone with Blender?). 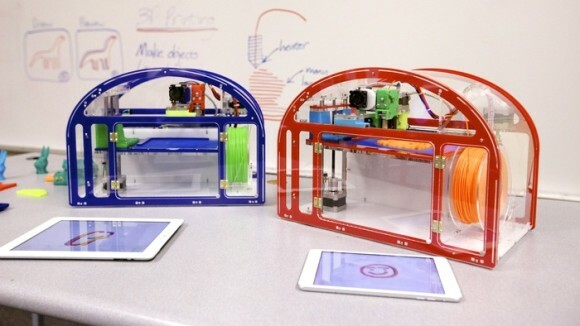 Enter Printeer, a new project funded on Kickstarter which aims precisely at building a kid-friendly 3D printer to be used at home but also - and most of all - in schools, classrooms, museums, libraries and all the other places where kids can play and learn. For Mission Street Manufacturing (the guys behind Printeer) making a 3D printer kid-friendly means many things. First of all Printeer is safe to use: moving and hot parts can't be touched because printer's components (motors, belts, printing head and so on) are enclosed in a case, only the printing plate can be accessed to remove printed objects. The case is clear, so kids can't touch anything but can see all that's happening in the printing process. Safety means also using only PLA filaments instead of ABS. Kids usually don't want to learn how to use a CAD software before playing with a new toy, so Printeer is controlled by a simple iPad app. Printeer team say that Kids are more confortable with a tablet than a computer and Printeer software can be "learned in about 30 seconds". As it seems, using Printeer is just a matter of designing something new and press a "print" button somewhere. From a technical standpoint, Printeer is a desktop printer (40 x 23 x 30 cm) with a printing volume of 15 x 10 x 12,5 cm. Small, but it should be more than enough to let kids play and learn with 3D printing. 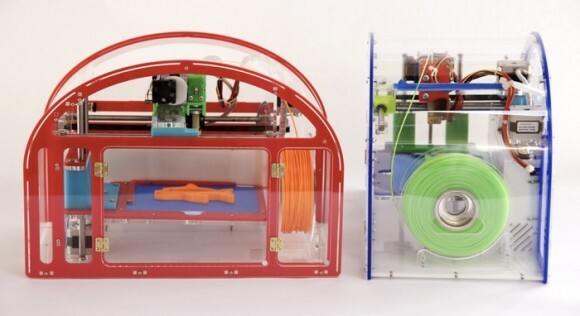 The printer is managed wirelessly and uses only PLA in a 1,75mm filament. It's built with "a variety of open-source software and hardware", but there are no details on what's exactly used. The project is fully backed on Kickstarter: they got more than twice their goal (50.000 dollars) with two weeks still to go. Pre-production samples should be delivered next month, first production batches are planned for October 2014 and February 2015. The first batch will be assembled in a garage, very startup-style, while the second one in a real factory. More info on the Kickstarter page.